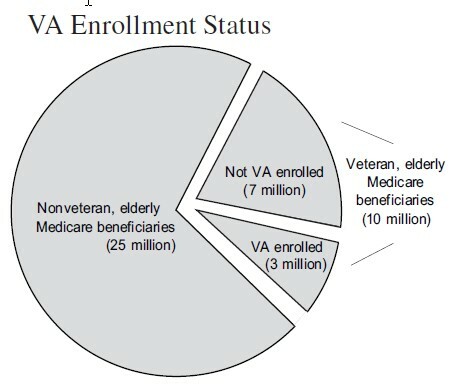 The figure below from my 2008 JHPPL paper with Steve Pizer and Ann Hendricks (ungated summary here), illustrates the overlap between the veteran and Medicare populations. The numbers are from approximately 2003, so they’re a bit different today, but not wildly different. The whole pie represents all elderly Medicare beneficiaries, of which there were about 35 million around 2003. Of those, 10 million, or almost 30%, were veterans. Of course, the vast majority of veterans of that age are men. Though less than half of elderly Medicare beneficiaries are men (women live longer), it’s a rough estimate that 50-60% of male, elderly Medicare beneficiaries are veterans. Few know this fact, but that doesn’t make it untrue. There’s overlap between VA patients and Medicaid too. More on the overlap between the VA and other types of health insurance in this prior post. Interesting stuff. It’s worth noting that not all Veterans can enroll in VHA care – broadly you have to either have a service connected disability or financial hardship (which would explain the medicaid duals). Also, I’d be hesitant to use the 2003 data as particularly representative of the VA population as a whole (for the elderly, you’re probably safe). Since 2003 we’ve had 7 years of wars with lots of young men and women becoming eligible for and enrolling in VA care. My understanding is VA’s population these days looks like a big camel back now with a big hump of WWII-Vietnam era Vets and big lull during the 80s and 90s generations, and then an equally big or bigger hump for the OIF / OEF generation. There ought to be a chart out there with number of VA patients by conflict, but I can’t find one.